Abel W. Streeter of Shelburne Falls, Massachusetts is credited with at least four brace patents. The earliest of those patents is marked on this brace that rates an "A" (fewer than 5 examples seen) in Ron Pearson’s book. The patent is #12289, awarded on July 23, 1855. It is for "center fastening bit" and apparently includes a window in the chuck for aligning the bit when it is tightened with a side screw. (Note that the chuck shown on an earlier unmarked Taylor patent brace has a similar device). Streeter apparently manufactured his own braces, for this one is marked with his name and location, as well as the patent date. The wrist handle on this brace is composed of two halves of turned beech, pinned into a central slot or flange in the shaft. The cup handle is turned from beech in an almost European fashion, and has a distinctive urn-shaped iron quill. A second brace of mine marked with this early patent is also marked with the 1855 and the date of Streeter's second patent (No. 16938) issued on March 31, 1857 (Pearson "B"). This brace, while sharing the same chuck mechanism, is distinctly different in appearance. 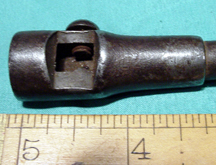 It has a swollen area of the iron shaft for a wrist handle, and a fairly conventional iron cup handle attached to an unadorned nearly cylindrical quill. 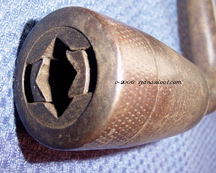 The patent includes the details of the mechanism of attaching the top handle and quill that is shown on this brace, as well as proposing a jointed frame to allow it to collapse into a smaller package. This feature is not found on my brace. Streeter's fourth brace patent was No. 61113, issued on January 8, 1867 (Pearson "B"). It features a conical chuck shell, knurled at the bottom, that twists to close the jaws that ride in protective slots. The chuck is quite "quick acting" with the jaws fully opening and closing within one turn of the shell. 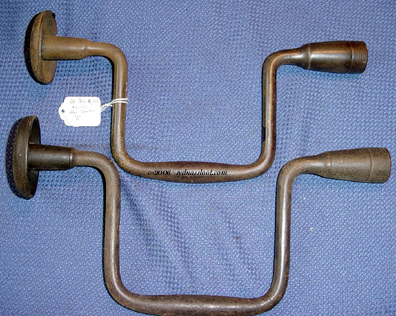 The two braces below are marked with the patent date, Streeter's name and the Shelburne Falls location. The smaller is about a 9 inch sweep, and the larger, 10 inches. Both braces have iron cup handles and a swollen frame for the wrist handles.